From San Diego North County, the heart of golf manufacturing, Golf Instruments™Co. presents three unique loft-lie gauges. Now measure loft-lie angles of woods, irons, and putters with consistency and accuracy never before possible. 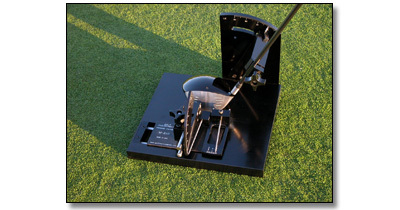 The compact design (10" x 11" x 9") makes them easy to install, move, and maintain, and at 18 lb. they stay put on your work bench. Not a toy like some, but a loft-lie gauge you can certainly afford to have... and cannot afford to be without in a profession where only the best survive. Machined from billet aircraft aluminum. Linear ball bearings for smooth, light feel. Precisison open-closed indicator insures neutral position. Type 2 anodized finish resists corrosion and scratches.